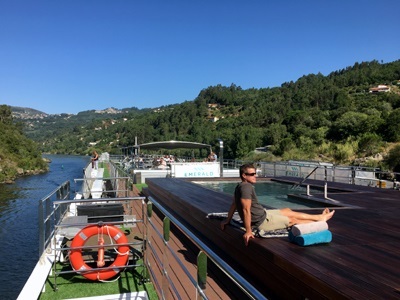 As we rounded a bend in Portugal’s Douro River headed toward the first and last port of call on Emerald Waterways’ Emerald Radiance, I could see the Luis I bridge in the distance. The double-deck iron bridge designed by a student of Gustave Eiffel of Eiffel Tower fame is a Porto landmark. Passing beneath its graceful arches I caught a glimpse of young people jumping off its lowest railing into the river below, a rite of passage I’m told. Next to them the pastel-colored buildings of the lively Ribeira neighborhood of arcades, restaurants and other amusements glowed in the late afternoon sun. 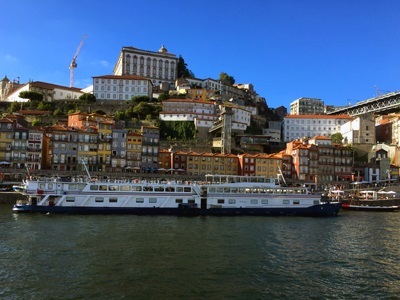 All week I looked forward to returning to Porto where our cruise began to see more of the city before disembarkation. But I had not anticipated spending a night in a hotel there. Yesterday, when we returned from our morning excursion, Bill immediately noticed the smell of diesel fuel in our cabin but thought nothing of it as the ship had just made a refueling stop. An hour later a puddle of diesel fuel appeared on our cabin floor next to the window and the ship’s engineer was notified. Ten other passengers experienced a similar problem, a smell so strong we could not remain in our cabins. At the end of the cruise the cause was still under investigation, but the cabins had been cleaned, the smell had dissipated and steps were being taken at future refuelings to ensure the problem did not reoccur. A good cruise line responds to unanticipated incidents such as this with grace and the staff on Emerald Radiance performed admirably. They immediately acknowledged the problem and set to work finding a solution. The ship’s hotel manager arranged for all of us to spend the night in the Carris Hotel in Porto just five minutes from the ship. After a lovely dinner and entertainment on board we were whisked off by van, returning in the morning in time for our scheduled tour of the city. We boarded an Emerald motorcoach and set off across the Luis I bridge to Gaia on the opposite side of the river where port wine warehouses are located and stopped at Taylor’s Port for a tour and tasting. Philip Brunner, one of the managers, told us how the grapes on Taylor’s three vineyards up the valley are picked by hand and stomped by foot the traditional way. 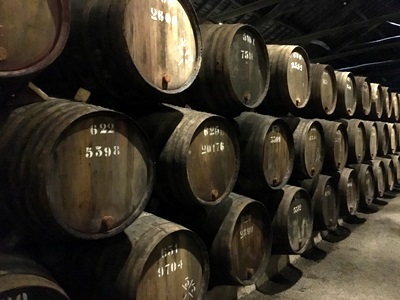 He explained the fermentation and aging process, telling about a rare single harvest port that has aged for 162 years and has three times as much sugar as Coca-Cola. In the tasting room we sampled a chip white port, extra dry and ideal as an aperitif. Back across the river, we left the motorcoach for a walking tour of Porto, Portugal’s second-largest city with a population of about 250,000. 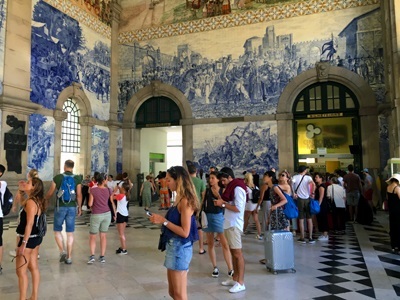 We passed the Stock Exchange Palace where a statue of Portuguese explorer Henry the Navigator points toward the Atlantic, peeked inside the public market and the railway station where huge blue and white tiles on the upper walls depict Portuguese scenes. We strolled down Santa Catarina, the pedestrian shopping street, stopping to take a photo of the belle époque Majestic Café where J.K. Rowling sipped coffee and wrote part of her Harry Potter books when she lived in Porto. We hoped to return at the end of our tour to see the interior or relax under one of its umbrella tables outside. Around the corner we noticed a queue of people stretching more than a block and wondered what the attraction must be. It was the line to get inside the Lello Bookstore containing the winding staircase that supposedly inspired Rowling’s description of the one at Hogwarts. The Harry Potter books and movies have made the 1906 store so popular it charges an admission of four euros that can be applied to a purchase. The long line made us decide to skip the store, settling instead for a coffee down the street at the Café Christina near the base of the Torre dos Clerigos bell tower. The Harry Potter staircase will have to wait for another trip to Porto. 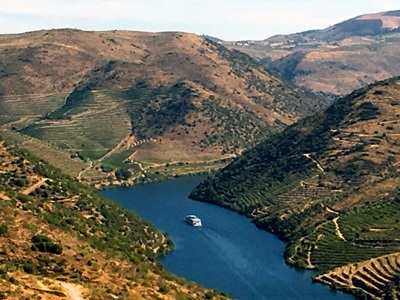 Scenery: Gorgeous views of the river valley from the ship, with terraced vineyards and wine estates on the steep banks on both sides of the river. Charming villages and cities to explore. Going through the five lock and dams on the river caught our interest. Weather: Not a drop of rain all week. We’ve been told that summers can be very hot in the valley, but on our cruise near the end of July temperatures were warm but not oppressive. A dip in the pool on the sundeck cooled us off on the warmest afternoons. Excursions: With the exception of our walking tour in Pinhao spoiled by nightmarish traffic, all the shore excursions were worthwhile, including the Coa Museum of prehistoric rock art, the day trip to Salamanca, Spain, the walking tour of Lamego with its 686-step staircase and the additional cost excursion to the baroque Mateus Palace. On Board Activities: A musician performed in the lounge nightly, but nightlife is low key on Emerald Radiance. 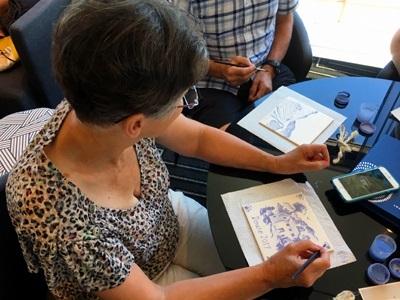 During the day there were cocktail and cooking demonstrations, a galley tour, tile painting workshop, demonstrations from experts on cork and Portuguese filigree work, dinner out one night at a wine estate. Food and drink: Sumptuous and satisfying, a nice mix of continental dishes and Portuguese fare. Wine and beer at lunch and dinner are included in the cost of the cruise. Cabins: Panorama Balcony Suites, the most common cabin type, are modern, clean and comfortable. The combination window/balcony is a clever idea, but may disappoint passengers who expect to spend lots of time sitting outside on a balcony.